'Methodist Heritage' is the name for the work of the Methodist Church in Britain aimed at preserving its heritage and using it as a tool for contemporary mission. In 2008, the Methodist Church's governing body, the Methodist Conference, received a report highlighting the value and untapped potential of the Methodist Church's historic sites and archives. The Conference approved recommendations in that report to convene a strategic Methodist Heritage Committee and employ a Heritage Officer within the Connexional Team to coordinate and support its heritage resources. 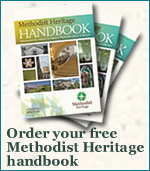 The Methodist Heritage Committee oversees the publication of the full-colour visitors' guide to Methodist heritage sites of historic importance, the Methodist Heritage Handbook, and supports its distribution through travel trade and Christian exhibitions, as well as directly to church congregations and visitors to Methodist Heritage sites. The Methodist Heritage Committee also publishes a twice yearly newsletter: Heritage News. The Methodist Heritage Committee has done work on the theology of heritage as a mission tool and on the organisation of its sub-committees and groups to improve support and service to those with interest in and/or the care of Methodist heritage across Britain. For work to conserve and use Methodist Heritage that is of significance to the wider Connexion, the Methodist Church offers 'Heritage & Mission' grants. These are awarded by an independent Heritage Grant Stream of the Methodist Church's Connexional Grant Committee. Copyright ©2013 Trustees for Methodist Church Purposes.